Home » About Us » Blog » What Size Emergency Fund Do You Need? Over the past few years, people’s sense of financial well-being has improved considerably. Nearly three-quarters of American adults stated that they were financially OK or comfortable in 2017, an increase of 10 points since 2013. Financial preparedness has also increased considerably over this time. Nearly 60% of adults say they can cover an unexpected expense with ease. One thing that can help people navigate life’s surprises–such as an automobile repair bill, health care expense or bill to fix a broken appliance–is an emergency fund. An emergency fund can also cover your costs during periods of under- or unemployment. Here’s how to start one and how much you should sock away for life’s unpredictable moments. Why Do You Want an Emergency Fund? Providing you with peace of mind. More than 60% of people say that money is a regular source of stress in their lives. Factors related to money, such as personal debt level, getting enough food to eat and being able to afford housing costs, are also significant sources of stress in people’s lives. Setting up an emergency fund assures you that should your financial situation change, you have a safety net in place to catch you. Helping you avoid more expensive financial solutions. You can find ways to cover an unexpected expense if you don’t have cash on hand or savings. Taking out a personal loan, using a credit card or borrowing money from someone you know are all ways to manage an unplanned-for expense. Borrowing money can be expensive, once you add in interest and other fees. Establishing an emergency fund provides you with the cash you might need for a surprise expense or in case your financial situation changes. Giving your money a purpose. Opening up a savings account for an emergency fund gives your money a purpose and gives you a goal. You are more likely to set aside the money you need each month into a separate account when you have a target to reach. Once you’ve hit your target amount, keeping the money separate from your checking account and other savings account makes you less likely to spend it on non-emergency items. Job change: Although people commonly associate a job loss with a need for an emergency fund, other job-related circumstances might improve if you have a financial cushion behind you. You or your partner might leave a full-time job and go back to school, one of you could cut back on hours worked to spend more time with your children, or you might find a “dream job” that pays less than you currently earn. As you adjust to your new life and job situation, an emergency fund can provide support. Car troubles: Cars break down. They occasionally need things like new tires or batteries. Your emergency fund can help you weather any surprise car troubles. Faulty appliances: Like vehicles, appliances require repairs or replacement from time to time. Having money saved means you can avoid putting the repair or replacement bill on your credit card. Moving costs: Depending on the services you use and how far you move, it can cost hundreds or thousands of dollars. If you have to relocate suddenly, such as for a new job, having savings can help you comfortably cover the expense. Health care expenses: Health insurance often covers a lot of medical costs but not all of them. Your insurance might not include certain medications or providers or you might have a deductible to pay before coverage begins. It can be worth saving up at least the amount of your deductible to pay for any potential medical expenses. Helping family: If a loved one loses a job or needs financial assistance and you want to contribute, your emergency fund could provide you with the freedom to help them. Taxes: Your emergency fund can also provide backup if you have an unexpected tax bill at the end of the year or in case you owe money when you file your return. New family member: Becoming a parent is exciting. It also brings expenses, such as the cost of baby gear or giving birth in your preferred setting. Your emergency fund can help you cover the costs of welcoming a new family member. What is a good emergency fund amount? The answer is, it varies. How much you should aim to save in your emergency fund depends on your current financial situation, your expenses and your financial dependents. As a general rule, it’s recommended people have anywhere from three to nine months’ worth of monthly costs stashed away in a savings account for emergencies. Monthly costs can consist of mortgage or rent, utilities, food and more. If you are just starting out financially or you have significant financial obligations, such as student loan or personal debt that limit how much you can save, start with a smaller goal, such as two weeks’ worth of pay or $1,000. As you earn money or pay down debt, you can focus on increasing the amount in your emergency savings account. You could also set a percentage of your salary to go toward the fund each month, such as 5% or 10%. Housing costs: Add up the cost of your mortgage or rent payment, your insurance premiums, property tax and cost of utilities. Food costs: Estimate how much you spend on groceries during a typical month. Debt: If you have debt, add up how much you pay each month. During a period of financial hardship, and depending on the type of debt, you might be able to request your loan servicer to pause payments. Transportation costs: Include how much you spend on public transit or your car each month, including gas and insurance payments. Childcare and education expenses: Include the cost of after-school care, educational programs for you or your kids, preschools or summer camps. Medical expenses: Add up your health insurance premiums as well as any out-of-pocket costs, such as out-of-network doctors’ visits or medications that your insurance doesn’t cover. Media expenses: This includes wireless phone and internet costs. Other: This might include costs associated with being a pet owner or your gym membership. If you find yourself facing financial hardship, you’ll most likely cut some unnecessary expenses from your budget. You might be less likely to spend money on dining out or on clothing you don’t need. You don’t want to restrict yourself too much, so you may want to build in a small cushion for non-essentials, such as cable TV. How easily can you find another job? If you lost your job or had your hours cut at work, how difficult would it be for you to find a similar role or a way to make up the difference in hours? If you are in an entry-level position, it might take you less time to find a new, comparable position compared to someone who has decades of experience or who is in a specialized field. 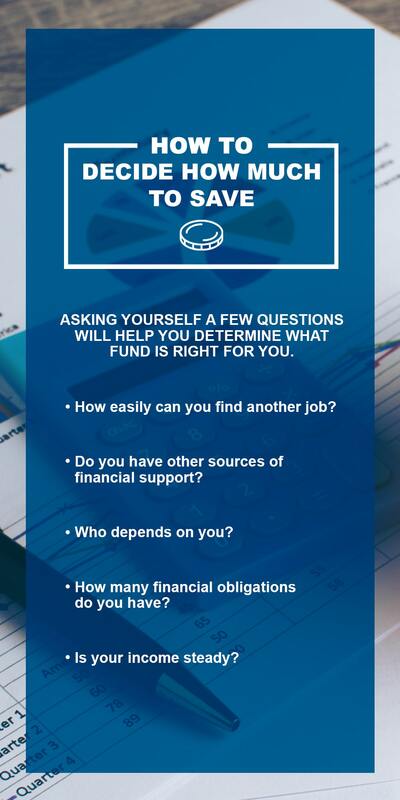 Do you have other sources of financial support? If your income changed or an unexpected expense arose, would there be another source of support to back you up? If you are in a dual-income household, you might be able to get by with a smaller emergency reserve compared to a single-income household. Who depends on you? The number of people who rely on you and your income also determine how many months’ worth of expenses you want to save. If you have financially dependent children, an unemployed spouse or a parent who lives with you, you’ll likely need to save more compared to a single person or a couple with no dependents. How many financial obligations do you have? The fewer bills you have each month, the smaller your emergency fund can be. If you don’t own your home or a car, you don’t have to worry about paying to repair or replace broken appliances or a broken-down vehicle. Is your income steady? If you are a freelancer or have an irregular source of income, it can be helpful to have more months of expenses set aside in your emergency fund. That way, if your income dips one month or you have a leaner-than-expected quarter, you have funds available to keep you afloat. Auto insurance: If you have a deductible, make sure you have enough in your emergency fund to cover it in case of an accident or another issue with the vehicle. Depending on the type of car you own and its age, it might be worth purchasing a more comprehensive insurance policy, so that you owe less out of pocket after an accident. Health insurance: As with car insurance, have at least the amount of your health insurance deductible set aside in case of an emergency. If you regularly need health care, you might consider a policy that provides more coverage at a higher monthly premium rather than a plan with a higher deductible. Homeowner’s insurance: Set aside at least the amount of your homeowner’s insurance deductible in your emergency fund. If you own items your policy doesn’t cover, you might also want to save up their replacement value. Life insurance: Your emergency fund can assist those you leave behind if something happens to you. Consider your life insurance coverage when building your fund as well. You can have too much of a good thing. Saving more than the recommended three to nine months of expenses in your emergency account won’t hurt you, but there could be better ways for you to save or invest your money. You could save more for retirement or use the surplus funds to start or contribute to another savings goal, such as a down payment on a house or your children’s college savings accounts. You have a few options when establishing an emergency fund. Since the money you set aside should be readily accessible in the event of an emergency, keep it in a liquid account. A savings or money market account can be good places to deposit your money. You might also use certificates of deposit (CDs) to build up your emergency fund. A CD ladder will help you take advantage of the higher interest rates typically offered by CDs without locking up all of your funds in a long-term investment. To set up a CD ladder, you could open a CD with a 12 month term. Then, you would open one with a 24 month term, followed by one with a 36 month term. You can also vary the amounts of the CDs. The point is to stagger the term length and amounts of the CDs you take out. When the CD’s term ends, you can access the money in the CDs without a penalty. If you do need to access the money in a CD early, you will pay a penalty, but the amount of the penalty depends on the amount in the CD. To learn more about this savings technique, visit your local Mid Penn Bank branch and chat with one of our representatives. 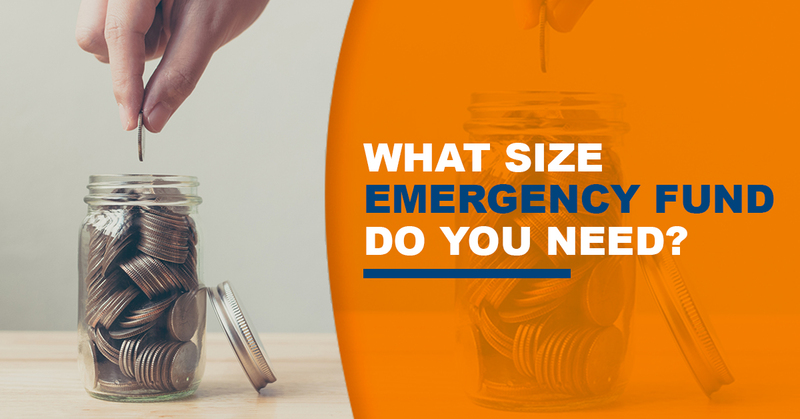 How you go about building up your emergency fund depends in large part on your income and how much money you have available after you’ve paid your monthly expenses. You may only have a small amount to set aside each month. That’s OK — it’s better to start small than not get started at all. Contribute what you can, even if it’s just a few dollars each pay period. As your income increases or your financial situation changes, you can save more until you’ve reached your goal. Happy Saving! Whether your target is $1,000 or nine months of expenses, it’s never too early or late to start building up an emergency fund. If you live in Pennsylvania, Mid Penn Bank offers multiple account options to help you get started. You can put your money in an interest-bearing savings account or open a certificate of deposit. If you want your emergency fund to earn interest but also want to be able to write checks from the account or use a debit card, a money market account might be the best option. Need assistance getting your emergency fund going or finding the motivation to save? Check out our tips to help you start saving today, and contact us with any questions about our financial options.